The Norwegian Queen faces tough critics for honoring the writer Knut Hamsun. Queen Sonja of Norway receives harsh critics for taking part on the celebrations of the Hamsun Year. ”We cordially report to Your Majesty regarding your personal participation on the inauguration of Hamsun celebrations. As you well know, Hamsun was arrested by the time the World War II was over and he had to pay a fine for his attested ties with the Norwegian fascist party presided by Vidkun Quisling”, says the Foundation in its letter addressed to the Queen. The Foundation believes that Hamsun should only be honored by people who love literature, and certainly not as a national symbol or a hero, considering that he was explicitly a Nazi. – Honestly, I think it is a scandal that the Norwegian Queen takes part on this celebration of Knut Hamsun. There were many Nazi geniuses, but I do not know about anyone who has been honored by a leader. 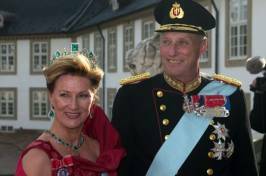 On August 4th, Princess Mette-Marit will be in charge of inaugurating the Hamsun Year, to take place in the Hamsun Center of Hamaroy. Mr. Tenembaum sees this as ”terrible”. The royal family, on the other hand, does not wish to make any comments on the subject. However, the Queen clearly said that the Knut Hamsun writer should be disconnected from the Knut Hamsun Nazi sympathizer. – It should be possible to have two thoughts altogether -, she declared to the magazine Se og Hor by the time of Hamsun Year’s launch.